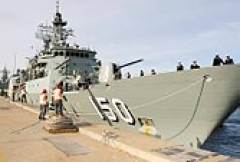 Envirofluid was able to provide the Australian Defence Force with Triple7 EnviroScale – a worksafe bio-based limescale remover which was guaranteed not to erode metal surfaces or create waste water treatment issues. The low risk acid blend especially designed with human safety in mind meant that minimal safety equipment was required and reduced risk to Defence members. Pipework and heat exchanger systems could be flushed insitu without the risk of corrosion or damage to elastomeric surfaces, resulting in very large labour and cost savings for the Australian Defence Force. Coupled with eliminated need, in some instances, to cut through walls and remove heat exchanger systems Defence also found that as a result of using GECA accredited, readily biodegradable, non-hazardous acid based chemistry they were able to reduce expense on effluent discharge while eliminating risk of H2S (hydrogen sulphide) fume generation, when recommended guidelines were followed. The Australian Defence Force was faced with extensive corrosion issues throughout their pipework systems including heat exchangers and fire mains following the use of acidic descalers. The pipework systems needed to be routinely flushed to remove limescale build-ups and the heat exchangers had to be removed for external cleaning adding to the complexity of Defence maintenance. The hydrochloric acid based limescale remover which the Australian Defence Force was using caused corrosion, which meant expensive equipment upkeep and replacement. The product was also hazardous, creating handling issues within confined environments. After flushing the hazardous trade waste also needed to be removed from site, resulting in high discharge costs. How can the Australian Defence Force effectively maintain their high cost assets with minimal labour costs and reduced asset damage, whilst meeting the ever growing requirements of worksafety and environmental compliance? Hydrochloric Acid has traditionally been used to remove limescale and calcium build-up. Hydrochloric Acid is registered as a Class 8 Dangerous Good with highly corrosive properties. The Australian Defence Force was experiencing extensive corrosion and high costs associated with the repair of heat exchangers and fire systems especially when the hydrochloric descalent was unintentually left in the system too long and / or trapped within ‘dead legs’ of the pipework. The product was also causing handling issues, and could not be used in confined spaces. POISON! DANGER! CORROSIVE. LIQUID AND MIST CAUSE SEVERE BURNS TO ALL BODY TISSUE. MAY BE FATAL IF SWALLOWED OR INHALED. INHALATION MAY CAUSE LUNG DAMAGE. Triple7 EnviroScale was substituted in place of the hydrochloric acid based cleaning agent. The powerful botanical formulation removes scale from virtually any surface, without corroding the surface material.